Ka'bah info [Chapter V] The Comprehensive Renovation of the Interior of the Holy Ka'bah. The external renovation of certain sections and cracks of the wall of the Holy Ka'bah was completed in the year 1415 H., according to the instructions given by the Custodian of the Two Holy Mosques. Open scaffolding was put up and the repairs took place in full view of the worshippers. This work done in front of the people reflects the Government's care and attention towards Islamic rites and rituals. 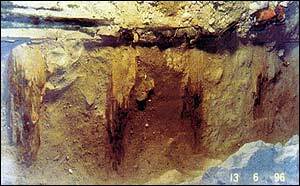 Because of this, many worshippers made supplications on behalf of our rulers. 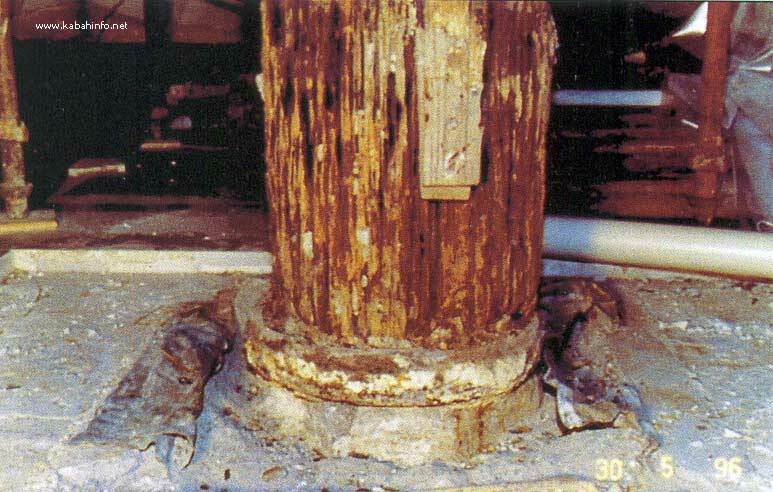 The corrosion in the base of one of the pillars. The commencement of the renovation motivated the rulers to attend to every aspect of the Sacred House of Allah, taking measures to ensure its safety and physical integrity for the present and future. The glory, dignity and honour of the Sacred House could not be touched. On examining the joints, it was evident that the humidity, fungi and white ants had affected the cracked portions. 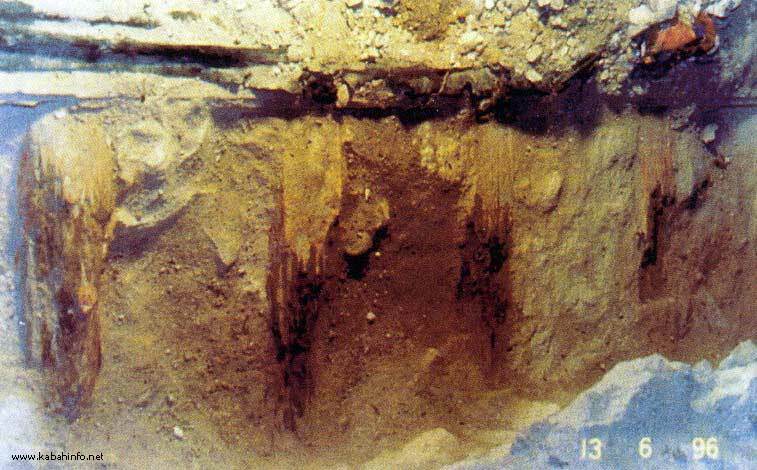 It was doubtful, however, that these might have penetrated into the interior walls of the Holy Ka'bah. 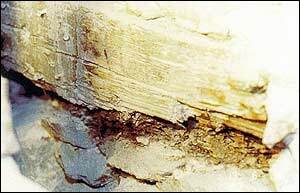 The corrosion in the wooden cross beams in the walls. The Government of the Custodian of the Two Hot, Mosques is inclined to maintain the proverb that says: 'Prevention is better than cure'. Any pure work to please Allah has a light. Thorough technical and architectural research was conducted inside the Holy Ka'bah to evaluate the interior status of the building. The external surface does not usually reflect the internal reality. It was assumed best to check for hidden damage and decay, by insects and mould, to the building and marble stones. Under the nine memorial marble plaques, carrying the dates of the various renovations, hidden damage and decay were found. The corrosion in the buried wooden cross beams. Our main aim is to benefit Islam and the Muslims and utmost care is taken to achieve this. From the interior of the Holy Ka'bah, random samples were collected and it was found that white ants and fungi had destroyed many materials on the floor and in the walls. 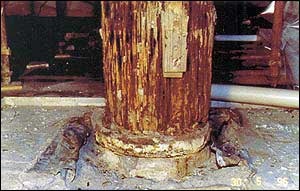 The wooden pillars, which were covered by a mixture of mud, sand and lime were also being invaded by insects and mould. 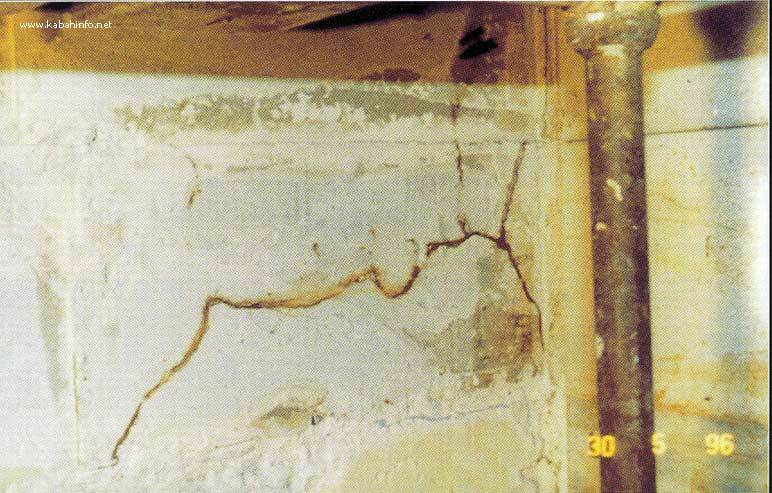 Humidity had eroded and decayed the deep, interior sections of the wall, as well as the surfaces. It was necessary to find better and stronger wall substitutes. in order to ensure against and prevent any further damage to the interior. Wooden cross beams of the ceiling. 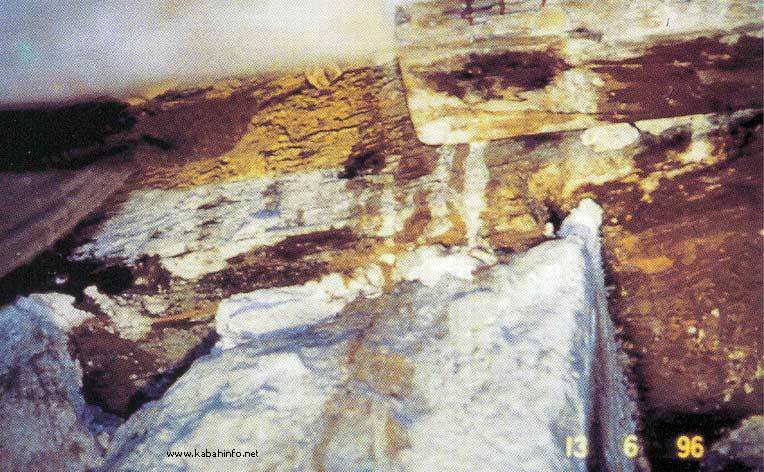 The corrosion in the inside coat of the wall of Ka'bah.